Moody’s, the bond-rating firm, has disseminated a new report on the credit quality of Virginia local governments — answering many of the questions we have been posing on this blog. The good news is that Moody’s rates Virginia’s business climate highly and says that local governments have “wide latitude” to protect their bond ratings by raising taxes and cutting expenses. The bad news is that local-government flexibility to raise property tax rates might reassure bond holders but is not a prospect that taxpayers will relish. Which raises the question: How likely are local governments to raise property tax rates? Moody’s does not get into that, but it does observe that that Virginia local governments have high debt burdens, big pension obligations, and aging infrastructure to contend with. High debt burdens can constrain local governments’ financial flexibility. In general, Virginia local governments have debt burdens that exceed national medians, largely due to debt issued for schools. High debt burdens lead to higher-than-average fixed costs, including debt service, the annual required contribution for pensions, and the “pay-as-you-go” portion of retiree health benefits. In turn, local governments’ flexibility to raise funds to address capital needs faces limits. The federal government’s major role in Virginia’s economy is a strength but carries some risk of cutbacks. The state is home to the world’s largest naval base and the Pentagon as well as a number of non-military operations. In 2016, it ranked first in the US in military spending as a share of gross state product (11.8%). While the Hampton Roads and Northern Virginia economies benefit from the large federal government presence, both face exposure to federal budget reductions, though massive cuts are unlikely. Continued private-sector investment will boost revenues and provide stability. A highly education workforce, weak union protections and significant population growth will continue to generate private-sector expansion. The expanding private sector will fuel tax base growth and provide a stabilizing factor in case of cuts in military and other federal government spending. Virginia has experienced a substantial bump in Eds and Meds with the higher education and healthcare industries consuming a greater share of employment. Legal framework helps local governments maintain solid reserves. Cities and counties can raise property taxes, their largest revenue source, without state-imposed caps or voter approval. The ability to control the tax rate, along with flexibility to reduce personnel costs, has contributed to strong financial positions. However, operating funds include school operators, so reserves generally trail national medians. I’ll provide details in future blog posts. This entry was posted in Budgets, Economy, Finance (government), Taxes and tagged Boomergeddon, James A. Bacon. Bookmark the permalink. Yes – Moody’s looks at a locality’s CAPACITY to generate revenues sufficient to pay their bills and that DOES include the ability to increase taxes! It’s the localities that have high costs and debts and far less ability to increase taxes that get the lower credit scores – and worth noting – they’re the same localities that received low composite index scores that then get them subsidies for K-12 – funded by the richer localities with the AAA credit ratings. Just looking at the map… NoVa, Henrico/Chesterfield/Charlottesville/Blacksburg and Hampton Roads. Also point out that the much-discussed “unfunded liabilities” of VRS is actually owned in large percentages by the urbanized localities with the big school systems of the more than 100,000 locality school employees and more than 200,000 currently receiving pensions from VRS. It’s the localities that fund these pensions and VRS tells them how much they “owe” to VRS each year to pay their share of the VRS pension fund. There is another factor beyond ability to pay. It’s whether or not the locality taxes its own citizens near or close to that ability to pay. It seems reasonable to expect NoVA, Hampton Roads and Richmond to have a higher real estate tax burden because they have more valuable taxable real estate than other parts of the state. But to be fair, all jurisdictions should impose a comparable tax burden on their residents. For example, let’s assume all of the cities and counties in the above-mentioned areas impose a real estate tax burden that ranges from 1.0 to 1.5% of actual market value. One must realize that some jurisdictions, e.g., the City of Falls Church, impose greater real estate taxes than some of its neighbors. Complete uniformity is probably impossible and, perhaps, not even desirable. Then the next question is: What is the tax burden of those jurisdictions with low ability to tax? Fairness would dictate that the tax burden, while likely much lower in dollar amounts, should be comparable to the burdens levied in the wealthier parts of Virginia. For example, let’s assume a house in Fairfax County is valued at $600,000 and the County taxes 1.2% of its market value each year. That produces $7200 in real estate taxes. Further assume a similar house in rural Virginia would sell for $200,000. A 1.2% tax would produce $2400. After adjusting for differences in costs, state taxpayers would need to pay the difference between the $7200 (ignoring for the moment the differences in costs) and the $2400. However, I suspect, without knowing, that the tax burden in much of recipient Virginia is less than 1.2%. Let’s say the burden is 0.06% or $1200. The difference between the actual tax burden and a fair tax burden should not be reimbursed by state taxpayers. What are the facts? do you think this does not accurately take into account things like the value of property? what would you change to be more like what you say needs to be done? Absolutely. But it shows only the value of property not what it’s taxed at. Two localities with similar per capita real estate values can tax their residents at greatly different rates. The locality that taxes at a lower rate should not get as much state aid as the locality that taxes its residents at a higher rate. And there should be a requirement in the LCI that requires a minimum local tax effort that should be comparable to the tax burdens imposed by wealthier districts. 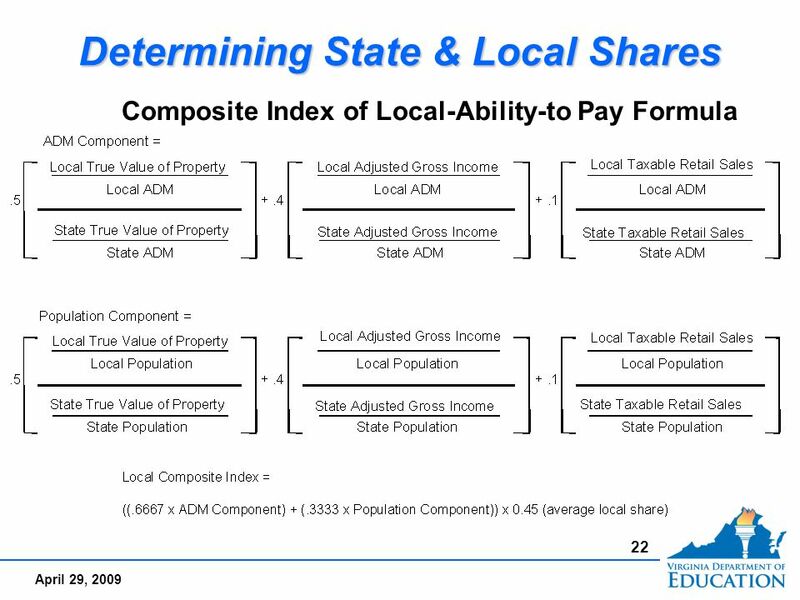 In other words, to get full state aid, a locality must impose real estate taxes at what is basically a narrow range built around a of higher value localities. Let’s say the local counties and cities with higher real estate values per capita impose a real estate tax that averages 1.3% (about what I think Fairfax County imposes). To recognize differences in governing philosophies, make that a range of 1.1-1.5% of real estate per capita. So any city or county that imposes a real estate tax of at least 1.1% of its real estate value per capita gets full state aid. If its tax rate is less than 1.1%, it loses some aid. This would make the LCI formula more fair and force rural VA to raise its own property taxes instead of just sponging on NoVA. All property in Virginia has to be taxed at 100% of the value. right? Did you look at the other measures – the income levels of the local population and the sales tax receipts? I thought the income levels affected how much the tax rate could actually be before it adversely affected taxpayers in those counties. I see what you’re saying but in a poor county – you don’t have much margin to increase taxes on a lot of folks.. they just don’t have the extra income – the margin between what they have in income and how much more they can pay in taxes is much thinner than in richer jurisdictions. In practice, most jurisdictions assess real estate somewhat below 100% of full market value in order to avoid a high number of challenges filed by taxpayers. For example, Fairfax County tries to assess residential real estate at 94-95% of market value. I’m not calling for a revision to the income and sales tax portions of the LCI formula. I’m not even calling for a revision to the real estate value. What I am saying is: There needs to be a revision that requires all localities to tax real estate at a minimum level that is comparable to the percentage, not the amount, of real estate taxes levied in wealthier parts of Virginia. Let’s make up a number — 1%. Of course, one percent will cost people a lot more in wealthier parts of Virginia. But there are many low-income residents of NoVA. They too get pinched by real estate taxes. And people with more valuable property get pinched more even when they might not have increased income. Bottom line: there needs to be a minimum real estate tax effort (expressed as a percentage of local real estate value) that is relatively uniform across the state. Poor areas pay less in total dollars; rich areas pay much more in terms of total dollars. But everyone gets pinched. From the Moody’s report as quoted above: ” Virginia has experienced a substantial bump in Eds and Meds with the higher education and healthcare industries consuming a greater share of employment.” Fine; that’s a good thing. But “Eds and Meds” are, ultimately service industries that contribute little to the net “trade balance” of Virginia’s economy in relation to the rest of the Country. Good point. Both Eds and Meds are pretty much local industries like Safeway and Giant. How does Virginia bring in money from the rest of the country without tying itself even more to Uncle Sam? Practioners of crony capitalism aren’t very good at strategic thinking.